The year was 1978. Olimpia had just survived the biggest crisis in its history: relegation to A-2 at the end of the 1975-76 season, thus playing in A-2 in 1976-77. Then, in 1977-78, the team nearly ‘dropped down’ again. With this, Olimpia hired Dan Peterson, coach of Virtus Bologna the previous five seasons, 1973-78. ‘The Coach’ is a native of Evanston, just north of Chicago on the shores of Lake Michigan. Peterson would take over for Filippo ‘Pippo’ Faina, who succeeded the legendary Cesare Rubini in 1974-75, as Rubini’s long-time assistant, Sandro Gamba, had taken over Varese in 1973-74. Faina had done what he could, even winning the 1975-76 European Cup of Cup Winners, but unable to avoid that fatal relegation, though he did bring the team back up to A-1 for the post-season in 1976-77. In April of 1978, however, Faina resigned from Olimpia. Dan Peterson had won the Italy Cup with Virtus Bologna in 1973-74 and the national championship in 1975-76. His team took 2nd in the playoffs in both 1976-77 and 1977-78, in addition to taking 2nd in the European Cup of Cup Winners in 1977-78. Before coming to Italy, Peterson was not a well-known coach, though he had been an assistant at Michigan State and Navy, and had enjoyed excellent success at the University of Delaware. He arrived in Bologna by way of the National Team in Chile, where he took ‘Los Rojos’ to 4th in the 1973 South Americans and 7th in the 1973 World Festival. He was hired by Virtus as a second choice, after Rollie Massimino, who had signed for the job, used an escape clause to sign as coach at Villanova. With Olimpia Milan, Peterson had extraordinary success and was the coach of the ‘Golden Era’ with ‘The Invincibles.’ Inhis first year, with the so-called ‘Basset Hounds,’ because they were not only the youngest team in Series A-1 but also the smallest, they reversed every prediction for dead last and relegation to A-2 by going all the way to the playoff final before losing to his old team, Virtus Bologna, using ‘small ball’ before that term was even invented. 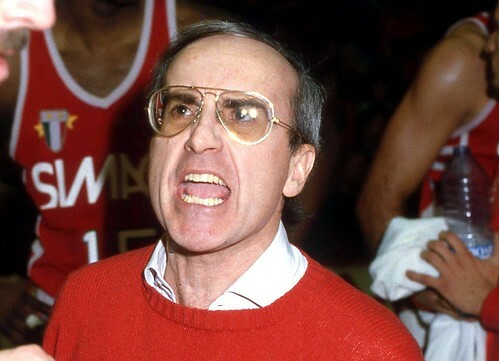 In 1981-82, he took Olimpia to its first title in 10 years, this time going with a bigger lineup, with 6’11” John Gianelli, 6’10” Dino Meneghin and 6’9″ Vittorio Ferracini inside. In the period 1981-87, Peterson took Olimpia to six straight playoff finals, winning the title in: 1985, with Americans Joe Barry Carroll and Russ Schoene; 1986, with Americans Russ Schoene and Cerdic Henderson; and 1987, with Americans Bob McAdoo and Ken Barlow. Their only finals losses were in 1983 against the Larry Wright-led Virtus Rome, and in 1984 against Virtus Bologna, without suspended super star Dino Meneghin. In that period, Olimpia also won the newly-reformed Italy Cup, in 1986 and 1987. They lost the 1983 European Cup of Champions final by one point to Ford Cantù and lost the 1984 Cup of Cup Winners final by one point to Real Madrid, unable to use recently-signed American, Antoine Carr. They won the European Korac Cup in 1985, beating Star Varese, 91-78, in the final, and the European Cup of Champions in 1987, beating Maccabi Tel-Aviv in the final, 71-69, thus completing a rare Grand Slam: Italy Cup, European Cup; Italian Playoffs. Peterson was great both on and off the court, as a TV commentator for NBA Basketball, a star of many commercials, a noted sports writer for ‘La Gazzetta dello Sport.’ He was also an innovator, as his practices were widely copied, as was his ‘L’ play, the first Pick & Roll seen in Series A, with Dino Meneghin setting the screen for Mike D’Antoni; and the famous 1-3-1 half-court zone trap defense, which was the signature for the many great comebacks made by the team in his time. He was also famous for his slogans, like “Spit blood!”, which he shouted to the team during games. And, “We are the 24th team of the NBA after the team swept the Italian Playoffs (6-0) and the Korac Cup (9-0) in 1984-85, behind ex-NBA superstar Joe Barry Carroll. He retired in 1987, at the top of his profession. But in 2010-11, Olimpia called and … The Coach was back!